Worried about Real Estate Greed? Feeling stressed about being ripped off? Don’t trust real estate agents to tell you the truth? Don’t know where to start or how to best position your home for maximum profit? You are right to be concerned – the traditional approach is a pretty ugly process consisting mostly of price reductions and senseless waiting. But don’t panic! It’s not too late to take control of your home sale and protect your profit. We’ve developed & certified an approach that that has proven to deliver consistent, superior results. And most importantly – Peace of Mind. It’s called the Value-Driven Approach to Sell Real Estate: A Practical Guide to Protect Yourself from Real Estate Greed and Bank An Additional $30,000 By Thinking Like the Great Warren Buffett. Up to an additional $30,000 profit? I recognize that is a bold statement to make. I’m certain you’ve heard such things before. It sounds like hyperbole. Salesmanship. And I would tend to agree with you, IF our approach was not well documented. IF the methods were untested. IF the claims were not, in fact, grounded in case study … after case study … after case study. In Other Words, Facts Not fiction. The fact is, when educated homeowners steer away from the price-driven model that most real estate agents peddle, and adopt our methodologies, these types of results are fairly commonplace. You see, most real estate agents are taught to fixate on what the house down the street sold for. Other agents, their sole objective is to sell the house as quickly as possible. And to put it bluntly, in most instances, a quick sale, in a hot market, does not require a lot of extra effort. We, on the other hand, choose to focus on ways to help homeowners extract extra (sometimes hidden) profit from the sale of their homes. We have taken to intense study of the world’s greatest financial minds and innovators outside of the real estate industry. We’ve studied Jobs, Bezos, Buffett and others. Through application of a core set of principles – by treating the home like a business with a stock price rather than a commodity with a sale price – we’ve proven there are unique ways to extract additional profits from any home on the market. From an outsider’s perspective, what seems like a spell of wizardry is actually quite systematic and predictable. 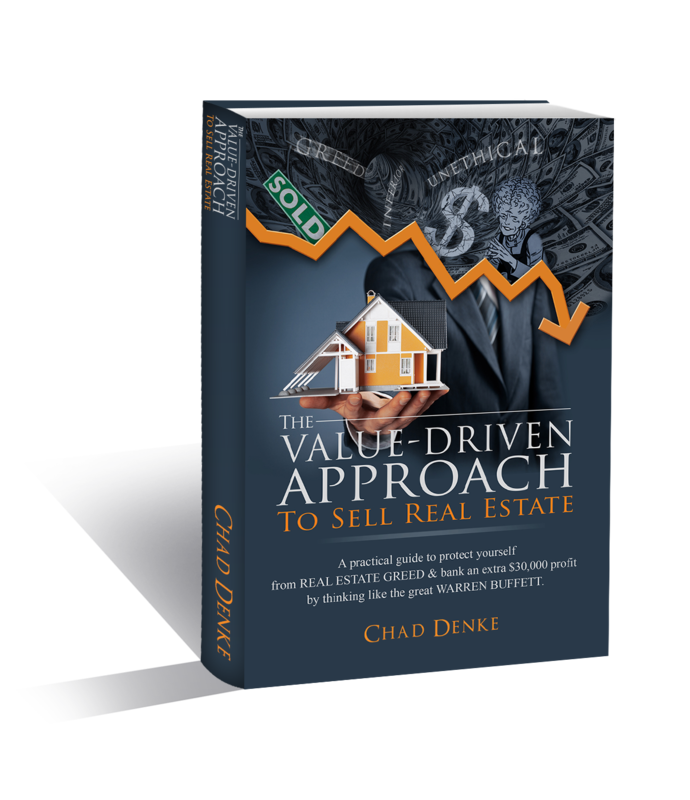 Homeowners that use the approach as outlined in our book are banking bigger profits and standing atop a much stronger foundation when selling their property. They are armed with the knowledge needed to detect and protect their profit margin. They know the right questions to ask, exactly where to look and what to listen for. Unfortunately, we’ve also read the horror stories from others who were not as fortunate; those who were misled and lazily cheated out of potential profit. Sadly, those are stories that often fail to make the headlines. Protecting YOU from Real Estate Greed. That is why we were motivated to develop this approach and to write this book. The book was never written or designed to be a literary masterpiece, nor a best seller. Rather, it was written with one primary objective. At the core, the book is about eliminating unnecessary risk and avoiding the fundamental mistakes that many homeowners make, either through their own naivety, or through the greed / incompetence of the real estate agent they choose to align themselves with. Those are eight words I hope never to hear from one of my clients or worse yet, someone else who was taken advantage of by another real estate agent lacking character, ethics and standards. And that is why this book is being offered for free. At Three Pillars Realty, we believe that there is no greater cause to fight for than the well-being, protection and superior results of our clients. The book is not for sale and cannot be found in bookstores or on Amazon. Rather, it is a book being shared, exclusively for free, in select markets across the United States and Canada. We are publishing this book to help people, not to make money by selling it. Awareness and contribution are the dual purposes fueling this project. To unshackle peoples chains through three fundamental mindsets: Purpose Before Profit, Client Protection above all, and Impacting Our Community. Copyright text 2017 by West Phoenix Homes and Lifestyle.